Iain Small and Pete MacPherson are on a roll. On Tuesday March 2 they visited the Eastern Ramparts on Beinn Eighe and came away with a new VIII,8 – Fear of the Cold and Dark. They started up the summer E1 Fear of the Dark before going direct up the very steep ground above. Serious, strenuous and fantastic climbing was the verdict! 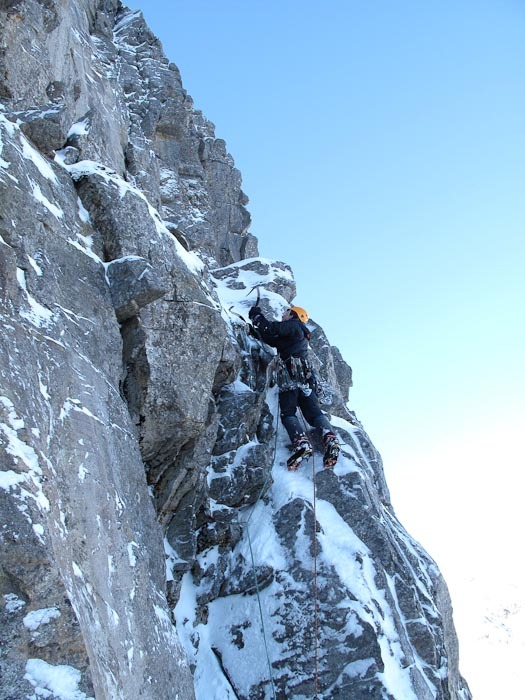 Also on Beinn Eighe, Andy Nisbet and Helen Rennard visited the Pineapple Cliff on February 28 and climbed the steep Pina Colada (VII,7) that takes the well-defined buttress between the left and central chimneys. Icy cracks made it hard work to place gear and Andy compared the route in stature and quality to the routes on the nearby Fuselage Wall. On February 18, Roger Webb, Martin Hind and Andy Wardle visited Liathach’s Coire na Caime and added Shining Glory, a good VII,7 mixed route to the buttress between Jerbil and The Andes Couloir. This entry was posted in New Routes and tagged Andy Nisbet, Andy Wardle, Beinn Eighe, Helen Rennard, Iain Small, Liathach, Martin Hind, Martin Moran, Pete MacPherson, Robin Thomas, Roger Webb. Bookmark the permalink.